Bronze AE21, 21mm, 4.1gm, issued c. AD 43. Obv: ...ΛEΩE MIΘPAΔ..., Diademed head right. Rev: Bow and quiver, lion skin with club and trident, IB below. References: Sear 5432, RPC 1910, MacDonald 313. 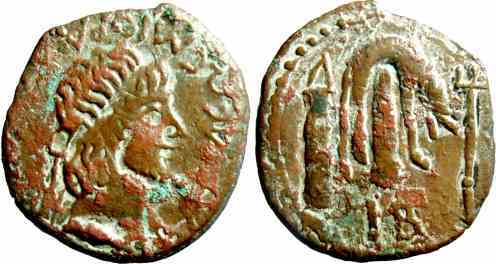 Mithradates III was the son of Aspurgus and Dynamis (the granddaughter of Mithradates VI of the Pontus). Claudius sent the governor of Moesia to oberthrow Mithradates and install his half-brother Cotys in his place.